Over the last week, images have appeared on the LEGO servers of some of the 2018 sets from LEGO Creator, TECHNIC and City, and they look like a lot of fun! I’ll be picking my favourite detail, as well as a few other notes from each of them. Let’s start with City. 60179 Ambulance Helicopter has come to the rescue of a snowboarder. 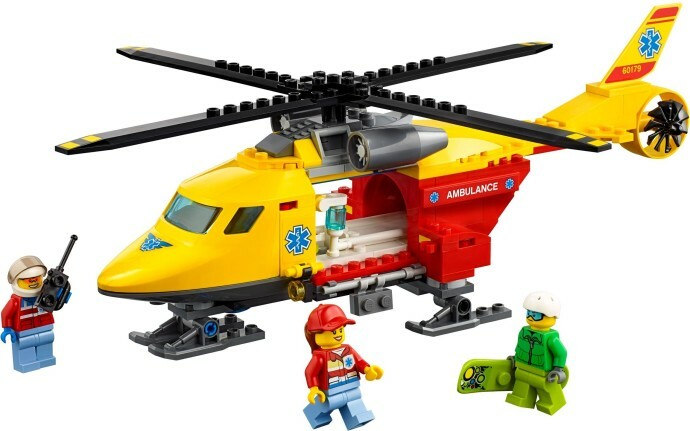 I quite like the look of the helicopter – the tail ‘s shape is very sleek. Favourite detail: the snowboarder and stretcher – I don’t have any stretchers yet! I know they’re quite common, but not for me. 60172 Dirt Road Pursuit is the next subtheme of the City Police – we’re in the mountains this time. I’m interested in the net cannon. I’d like to see how effective it is with a net. They’re quite light, so I can’t imagine it would work like the real thing. Favourite detail: net cannon, net and police dirt bike! 60181 Forest Tractor looks quite similar to 42054 from TECHNIC last year. I wonder if that’s a little nod to another set? 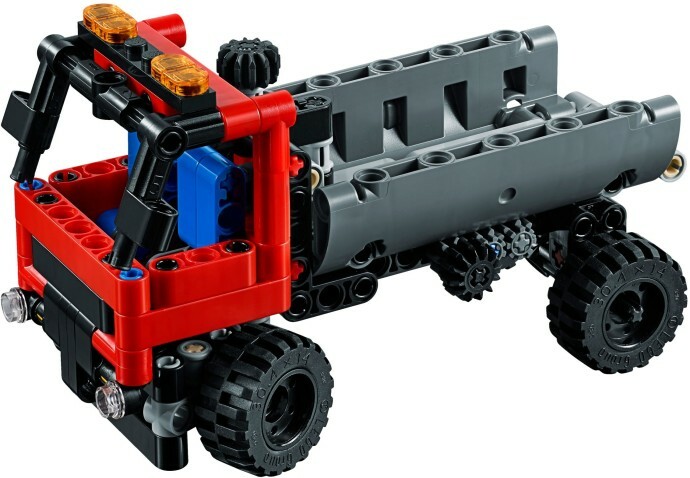 It looks like a very simply built tractor, but would be fun to pair it with 60059 Logging Truck from 2014. Favourite detail: it’s a pretty run of the mill (geddit) set, but if I had to choose, I’d go with the tyres. 60183 Heavy Cargo Transport looks like a fun one. A big articulated semi-trailer plus a little helicopter is great, although I’m not sure how easy it would be to back it up. Favourite detail: the shape of the helicopter’s cockpit – that cockpit window is great. I predict 60180 Monster Truck is going to be a popular one. It’s small, so will be cheap, and looks like a lot of fun to scoot around the carpet. I like the little ramp, and here’s my favourite detail: it’s got working suspension! There’s rubber bands on the vehicle, so it adds another fun play element. 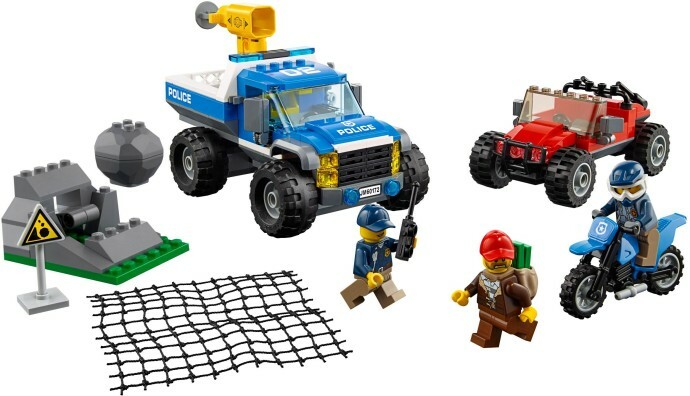 60173 Mountain Arrest looks to be the flagship set of this release. 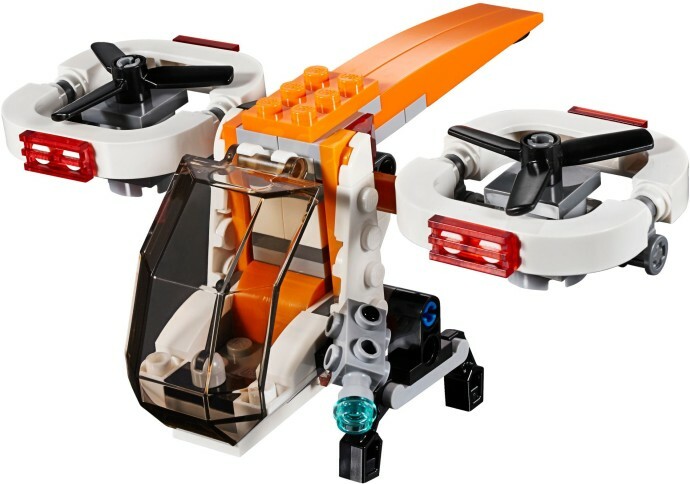 With a good sized helicopter complete with net cannon, and some great looking details, this one will get people buying just for some of the parts. 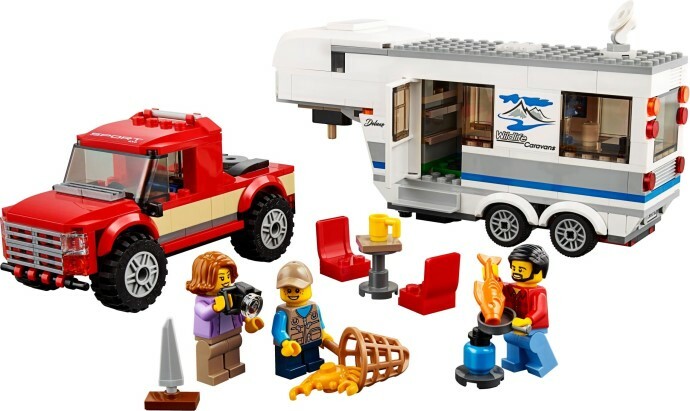 My favourite details in this one are easy: the new beehive element, the mountain man minifigure and the bear. 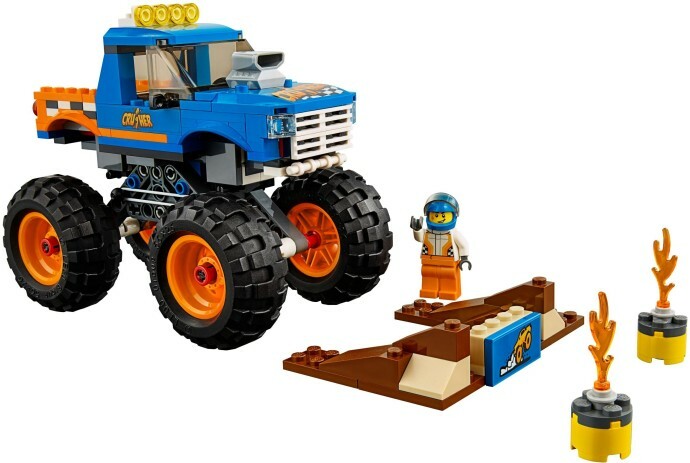 The last new image for City is this – 60182 Pickup & Caravan. This is an interesting set, as it looks like there’s a bit of continuity happening with this family. According to a few keen eyed fans, this is the same family that appeared in 60134 Fun in the Park, although the baby is now grown up! Anyway, back to 60182. They’ve got a great looking 5th wheeler with truck, and I love the little gas bottle cooker that dad is using. Favourite detail: that 5th wheeler. Ok, that’s City done, on to TECHNIC. First up is 42073 BASH! – a very strange name. It’s honestly got a bit of a working title vibe about it. 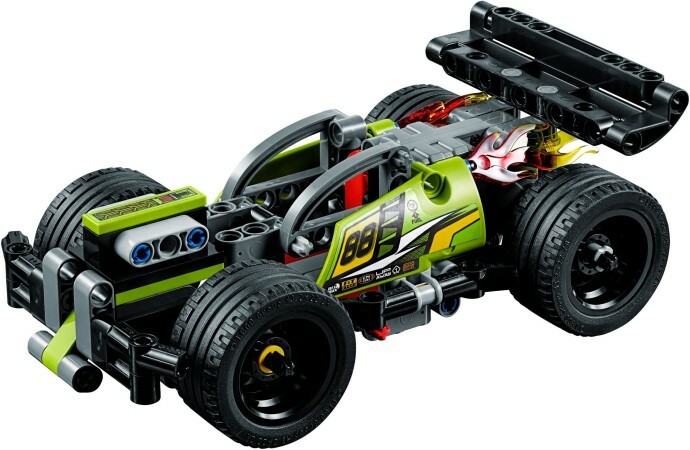 This is a very sturdy looking go-kart style vehicle with a pullback motor. I’m liking those flames. 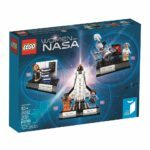 This looks like a good entry level set for those wanting to get into TECHNIC at a young age. 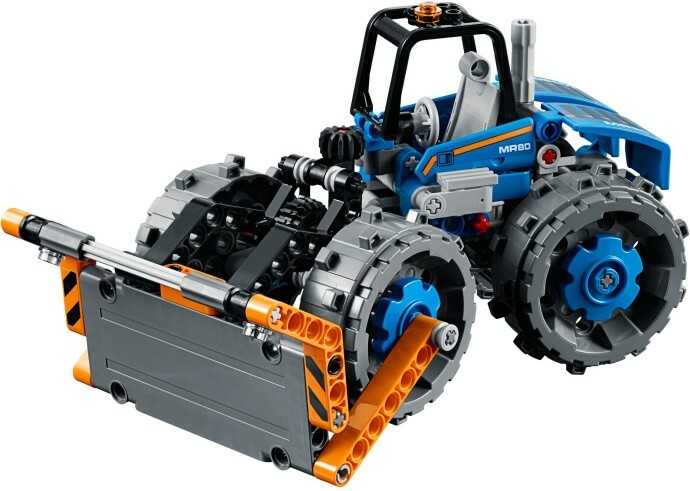 42071 Dozer Compactor looks interesting. A hand-of-god style steering mechanism in front of the cab, and those wheels! 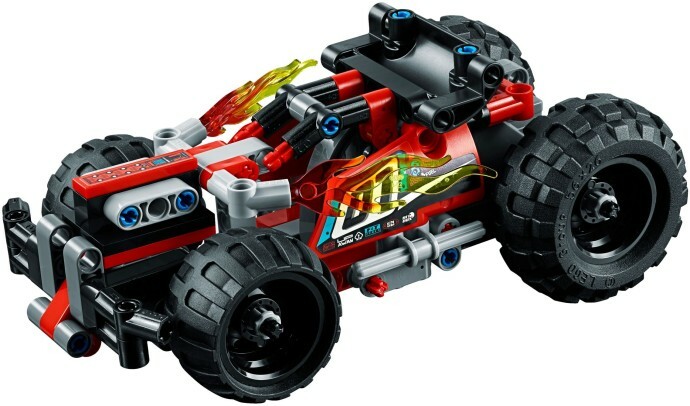 They have been seen in the Power Miners theme from 2009/10, and a Nexo Knights build from this year – 70349 Ruina’s Lock & Roller. They work really well as compactor wheels, although they wouldn’t get a very smooth surface! 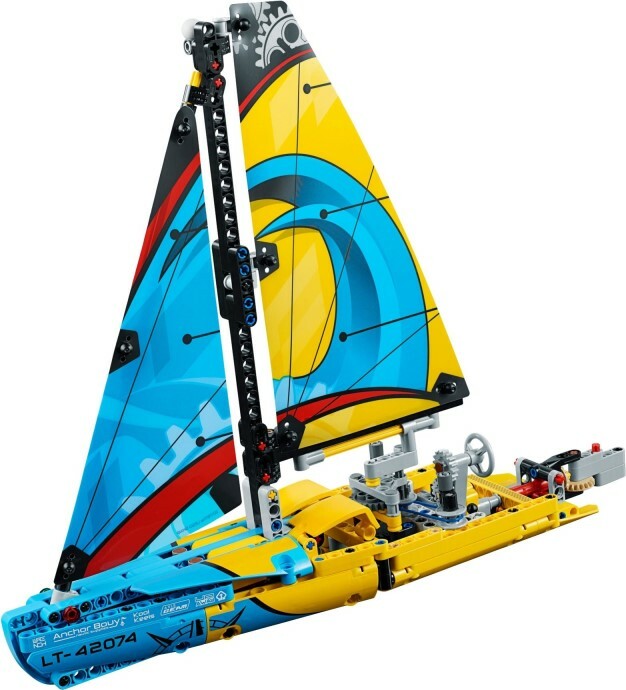 This one looks great – 42074 Racing Yacht. Bright colouring, a sleek looking design, and it looks like the rear sail has a bit of articulation to it! I love the cog designs of the sails. Here is BASH!’s counterpart – 42072: WHACK! The name makes sense now, with the two vehicles going head to head. It’s a clever idea and would be endless fun for a lot of kids (and adults – I’d enjoy it too). 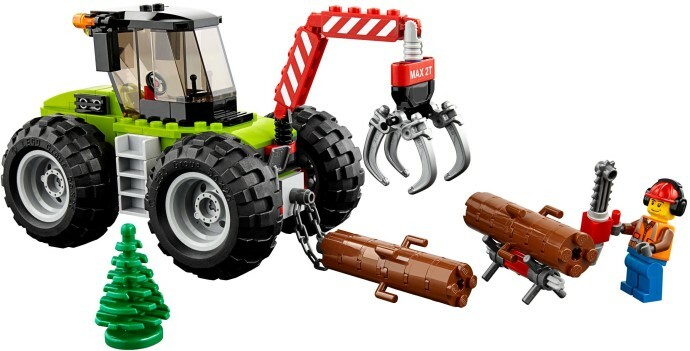 This has to be the oddest (and to be honest, ugliest) TECHNIC release in a very long time – 42084 Hook Loader. It’s absolutely tiny, and those tyres are comically small. I have no idea why they bothered. I was wrong about BASH! being the entry level build. This is it. It’s odd though, as both BASH! and WHACK! have much less elements than this one. Those two are in the 130s, this is 176. That’s all the TECHNIC images. Lastly, let’s take a look at the five Creator images. 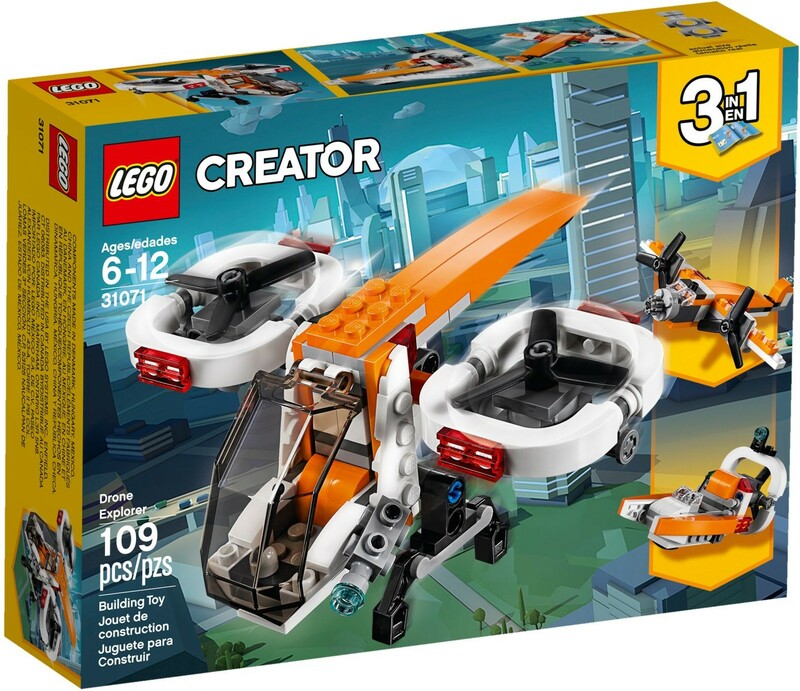 31071 Drone Explorer. This is a cleverly designed model, and by the looks of it, if you’re missing a few orange pieces, you can always replace them with a brick separator, and it will be fine! I really like this model. The engines are beautifully simplistic. I’ll be picking this one up for sure. 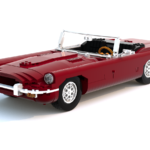 I reckon it will be cheap, and it’s also a 3in1 build, with a plane and boat as the B and C models. Next up is a little Formula 1 vehicle – 41072 Extreme Engines. Another 3in1 build, this also turns into a go-kart and a jet boat.I quite like the F1 car though. It’s quite simple, and minifigure scale. Another small one I’ll be picking up. 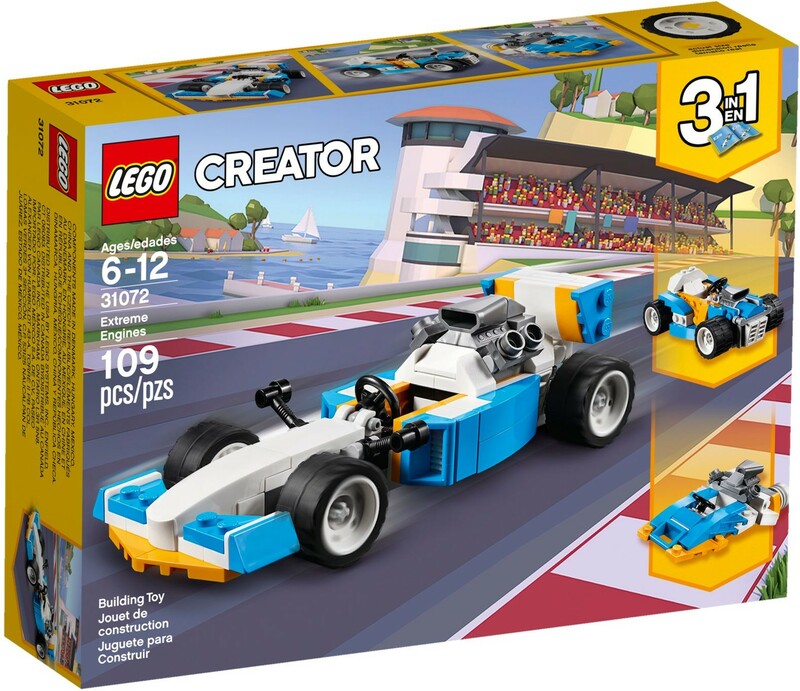 I want that engine, and an F1 driving down my Modular street is just what I’m missing. I’m wondering if 31075 Outback Adventures is aimed at the Australian audience? I’m not sure – our outback isn’t that green! I like this vehicle though. It’s got some spot on design elements, and those printed 1×4 tiles will be a good addition to any collection. The dog is cute too! 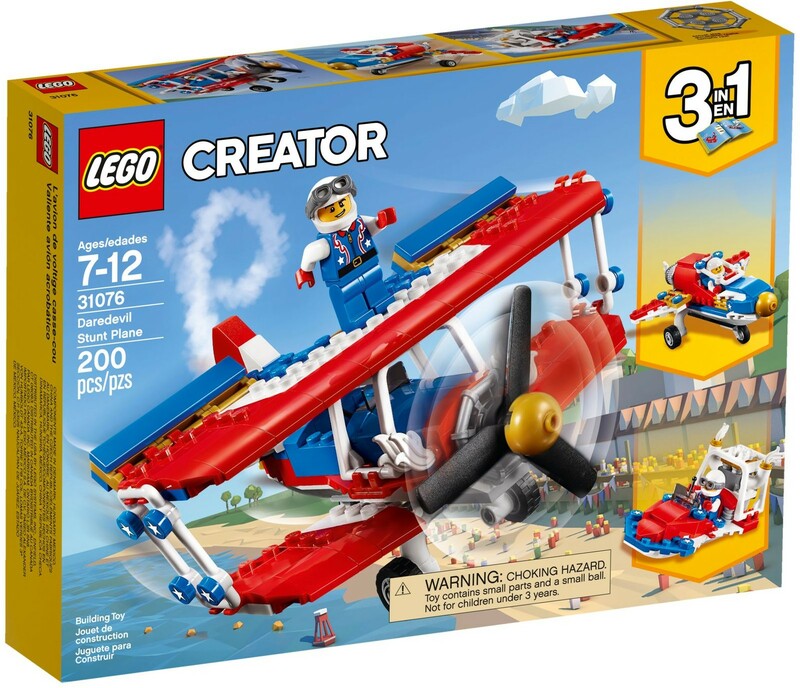 31076 Daredevil Stunt Plane looks amazing! 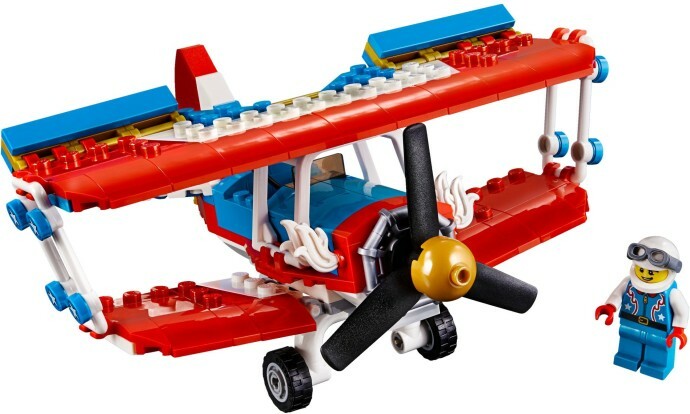 Beautiful, bold colours, clever design, and another 3in1 build, with a jet plane and hovercraft included as B and C models. This will look amazing in an airport scene, alongside the stunt planes from this year. Big fan of this one. Lastly, there’s my favourite one of all the images we’ve seen so far – 31081 Modular Skate House. I love this set. 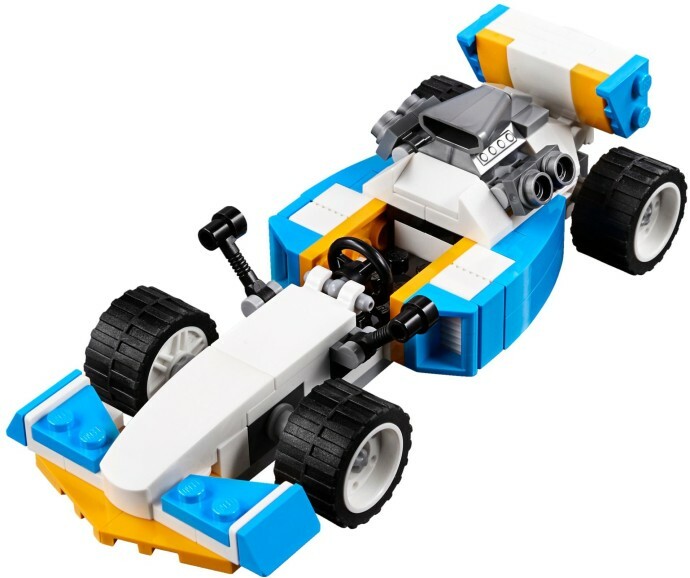 LEGO did something very clever this year and brought the modular idea to Creator. Now Creator houses are built in 8×8 or 8×16 compartments, and are able to be connected to others to build a dream house. 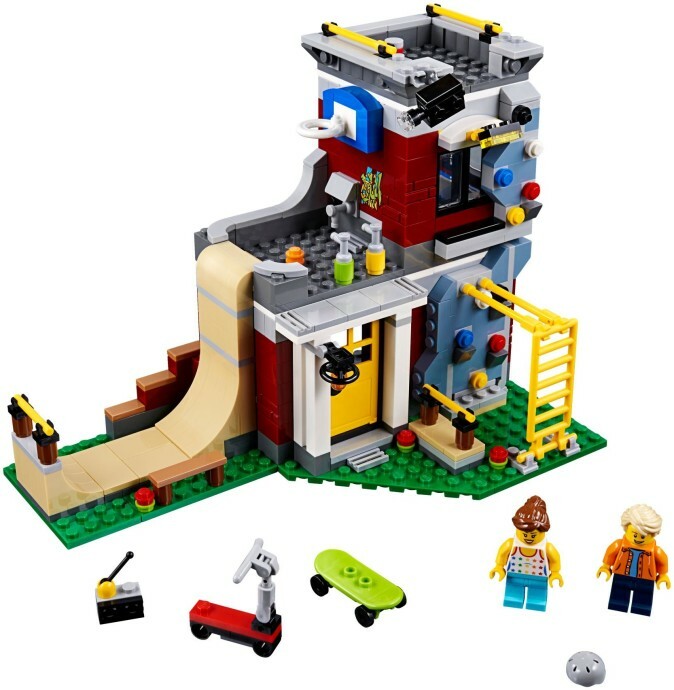 Now this dream house has a skate ramp, basketball ring, climbing wall and even graffiti and spray cans! That was one I was the most surprised at. Inside, the decor is very simple, but all the action is on the front of the building. I love this model. 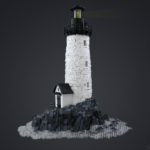 It’s unique, clever, well executed and adds so much more potential to the other Creator Modular buildings if you own them. I wonder where they’ll go next? That’s it so far for the 2018 image releases. What do you think? Are you looking forward to 2018 as much as I am?